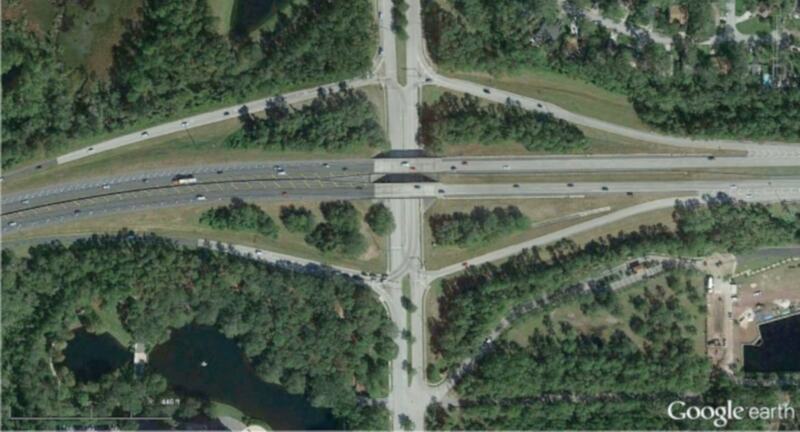 An existing diamond interchange will be converted into a Diverging Diamond Interchange (DDI) to help ease congestion, improve safety and accommodate future development in Jacksonville, Florida. B&N is leading the DDI project for the Florida Department of Transportation (FDOT), District 2. The DDI will be located on the six-lane San Pablo Road and pass under State Road (SR) 202, which is a four-lane divided limited access highway. The area surrounding the interchange is largely commercial and includes a large hospital campus. The DDI is being designed to ease congestion in the area and provide improved access for hospital patients and employees. The design and has been laid out so the DDI can be easily expanded should future conditions warrant. The planned design preserves an existing bridge on SR 202 to help lower the project costs. Bike and pedestrian accommodations will be included with the interchange conversion. The interchange will temporarily operate as a DDI beginning during construction to improve efficiency quickly and minimize construction impacts. As the prime consultant, B&N is overseeing a team of subconsultants providing signalization and lighting design and surveying, geotechnical and environmental services. Currently B&N engineers are preparing Phase II (60 percent) plans and related documents. An aggressive project schedule targets design completion in June 2019 and construction is anticipated to begin in September 2019.